On 22 June 1816, Britain's coinage changed forever with The ‘Great Recoinage’. It was the Government’s attempt to re-stabilise the currency of Great Britain following economic difficulties caused by both the French Revolutionary and Napoleonic Wars. Master of the Mint, William Wellesley-Pole was chosen to execute the reform. He recalled all earlier issued coins and issued new coinage. Across the country, centres were opened to undertake this massive task, and in just two weeks our coinage was reformed. In 1816, The Guinea, one of our most famous gold coins that had been introduced in 1663 by King Charles II was taken out of circulation. The public had to exchange their Guineas worth 21 shillings for the new (but lower value) 20 shilling Sovereigns, making the Treasury a fortune. Minted to mark the 200th Anniversary of the Great Recoinage in 2016, a new ¼ Guinea has been issued. The coin includes a VIGO mint mark in tribute to the most famous and valuable Guinea coin – The 1703 Queen Anne VIGO 5 Guinea. So called because of their VIGO privy mark denoting the coins were struck from gold captured from the Spanish bullion fleet. 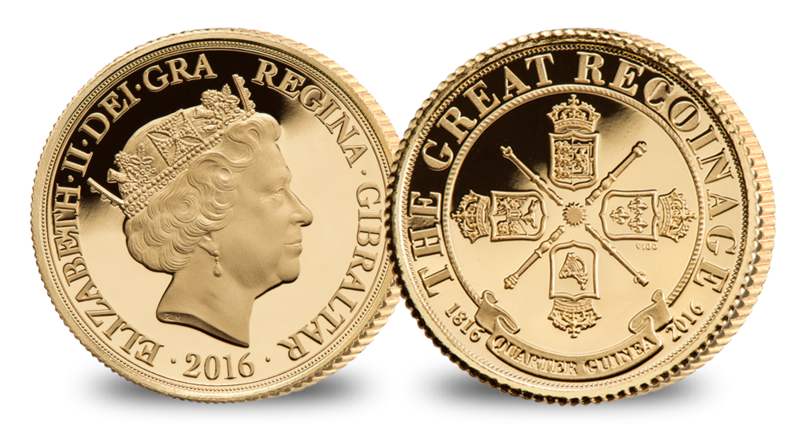 Fittingly today this 200th Anniversary ¼ Guinea is struck in Gibraltar.